In a new series, I create tape installations that allows the audience to create their own games. Games have constraints, such as the boundaries created by tape. 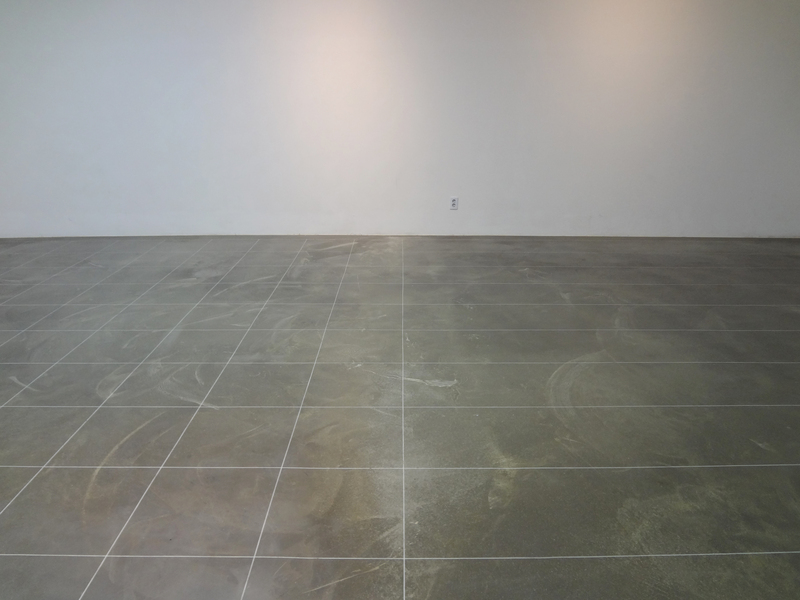 In this piece, The Grid I, I transformed an exhibition gallery using masking tape. One side has only parallel lines, while the other side has both parallel and vertical lines. 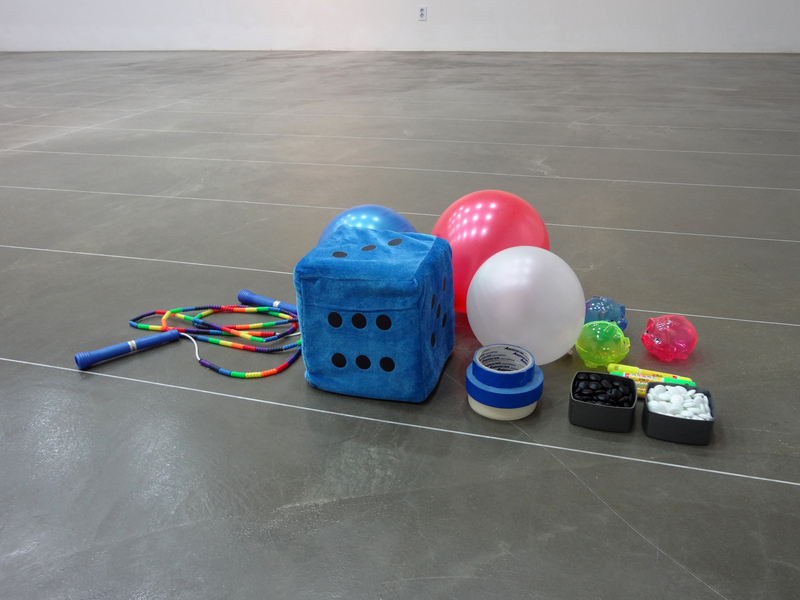 Agents of play were also provided, such as a jump rope, game tokens (in this case, baduk, or the Korean version of Go), a stuffed die, and balloons. 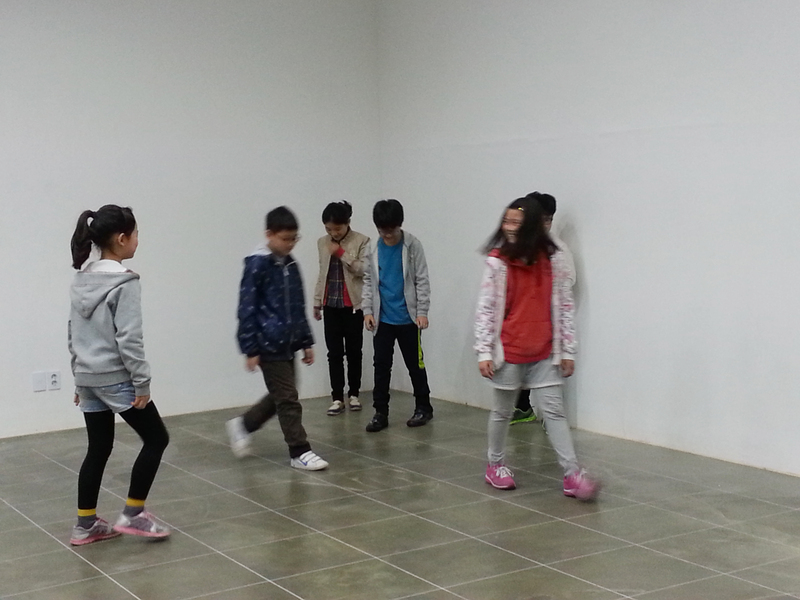 In the past week, I invited two groups two play with this grid. They had to create their own game, with their own rules, and utilizing the agents of play if they wished. They had to answer questions such as, “How many people or groups can play?” “How can I score a point?” and “How can I win?” (if it was a game about winning). 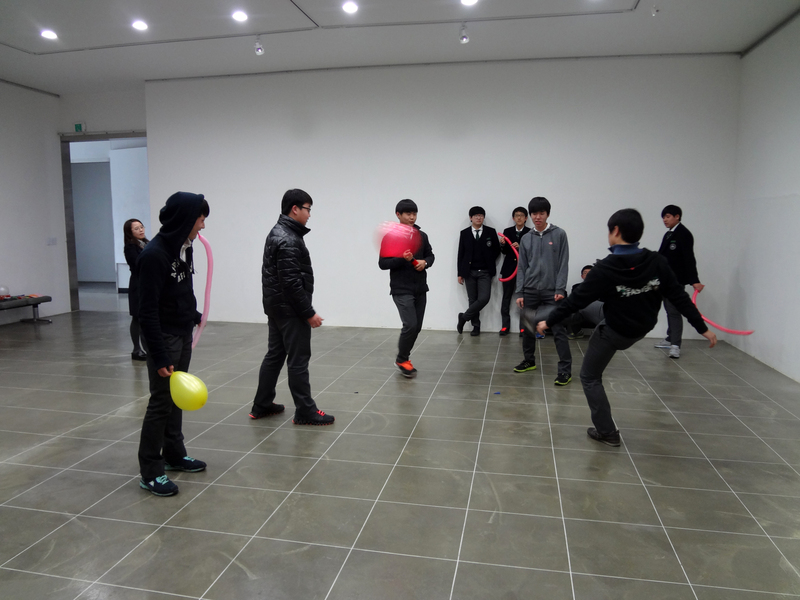 Players stand in a circle, avoiding the tape, and kicking a balloon without letting it fall to the ground. A player rolls the die, and the number corresponds to the number of baduk tokens he takes. 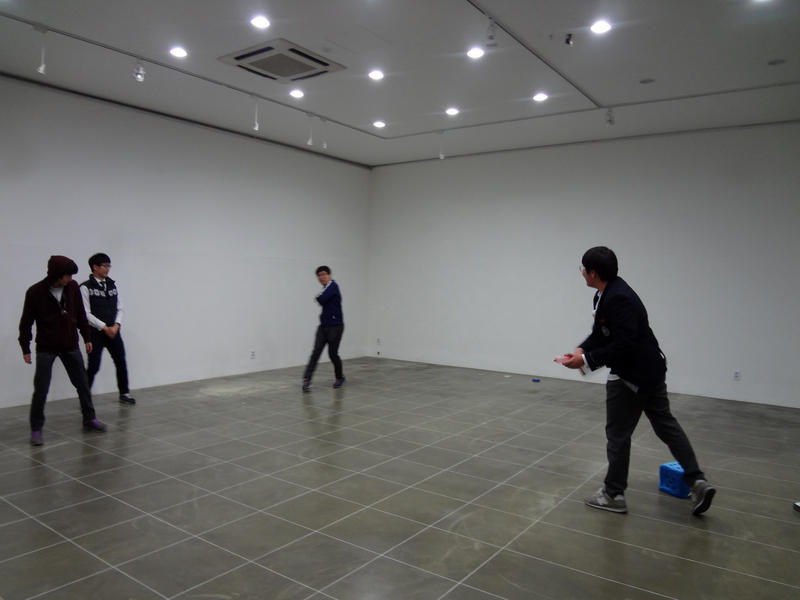 He throws the baduk pieces at the other players standing in a line opposite him, who try to avoid getting hit. 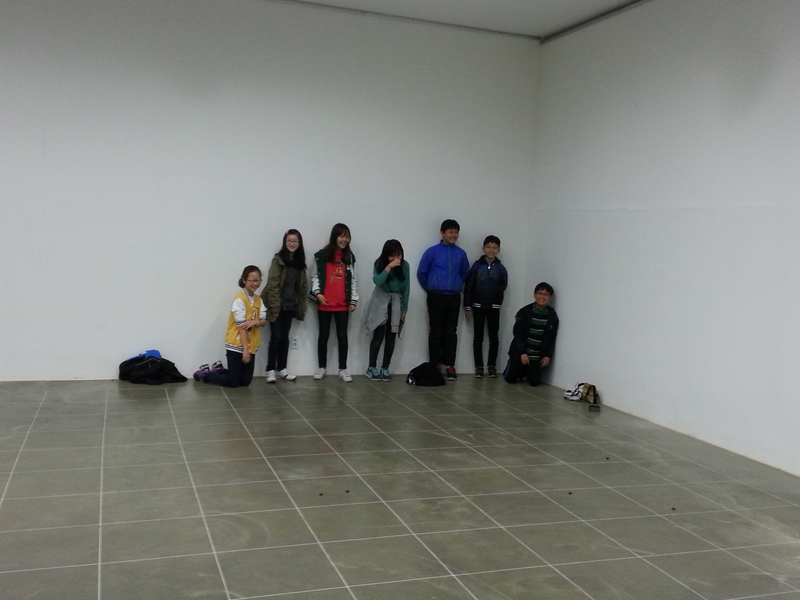 Players slid the baduk pieces across the floor. The one who slides the baduk piece the farthest wins. One player is the “king,” who is unknown to the others. They follow each other using the lines of the grid, whispering and finding out who is the king. 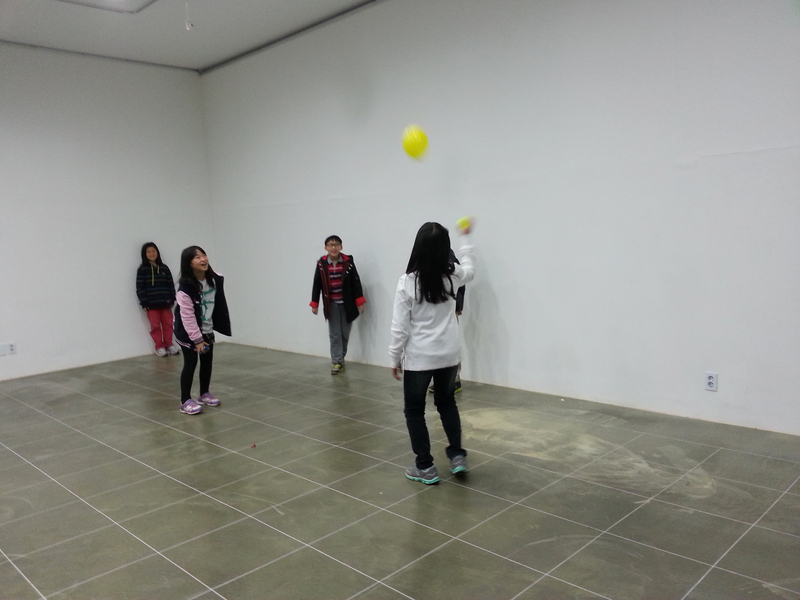 Players used the plastic piggy banks as modified rackets and took turns hitting the balloon. Players used the die as a ball, and the rope as a net. I learned a lot about children’s creativity and ingenuity from this project, and I think the kids had fun. It was fascinating to see objects whose function was completely changed for the purposes of games they thought of. 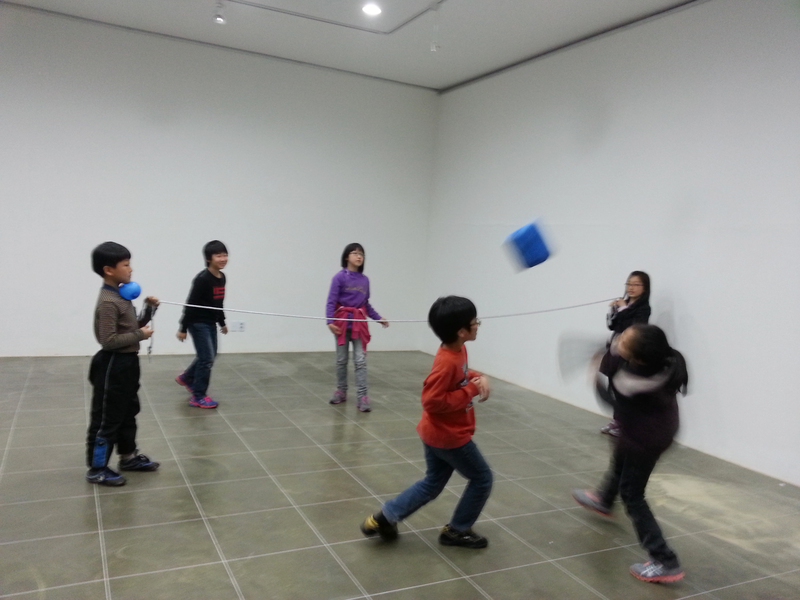 It was also interesting to see components of traditional games and sports (such as tennis and volleyball) be used. I definitely liked creating a piece where the audience had to interact with it for the artist’s intentions to be fulfilled. 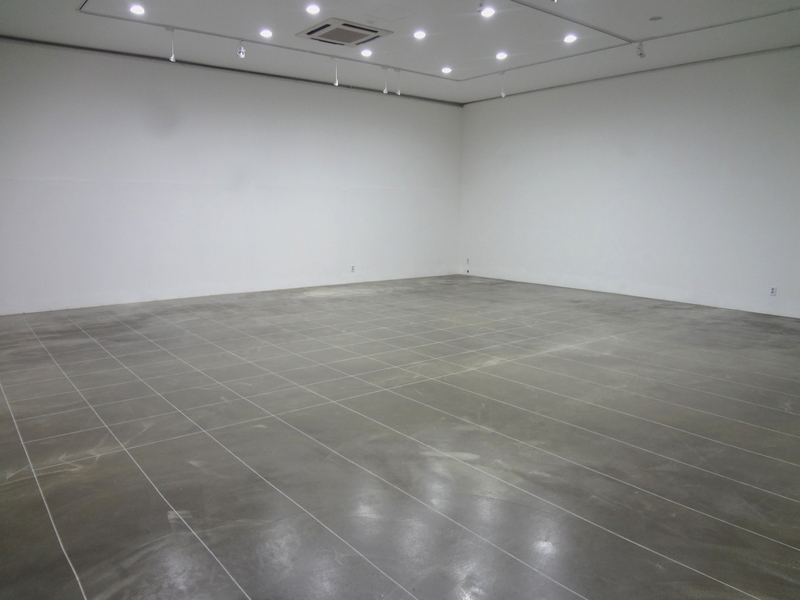 I would love to keep turning galleries and exhibition halls into playgrounds. Critically, these are children who are overexposed to online games—I was happy to get them unplugged from their smartphones and computers and plugged into their imagination. I’m definitely looking forward to pushing this idea further. Many thanks to Ms. Se-Hui Park of Shin-il High School and Ms. Ju-Eun Lee of Changdong Elementary School, their awesome students, and to the staff of The National Art Studio of Korea who assisted with organization and translation.